Sophocles' play the Antigone may have been written in 442 BCE in the latter half of the playwright's life. The play features part of the troubled history of the Theban royal family as it appears in Greek mythology. Different parts of this mythical history appear in some of the other ancient plays that have survived into our era. (Euripides' play the Bacchae relates to a somewhat earlier period in this saga.) The more immediate events leading up to those enacted in the Antigone concern her father, the ill-fated Oedipus, whose actions have far reaching consequences for all those around him, not least the citizens of Thebes itself. In Sophocles' play Oedipus the King we see how he, detective- like, discovers his true identity and the fact that he has unwittingly murdered his own father and married his own mother, a discovery that causes him to blind himself. The story of his subsequent exile, the prophetic curse he lays on his two sons, Polynices and Eteocles and his miraculous departure from the world of mortals is told in Sophocles' play Oedipus at Colonus. In Aeschylus' play Seven Against Thebes we see the brothers living out this curse with Polynices bringing a foreign army against the city to oust Eteocles from the throne. 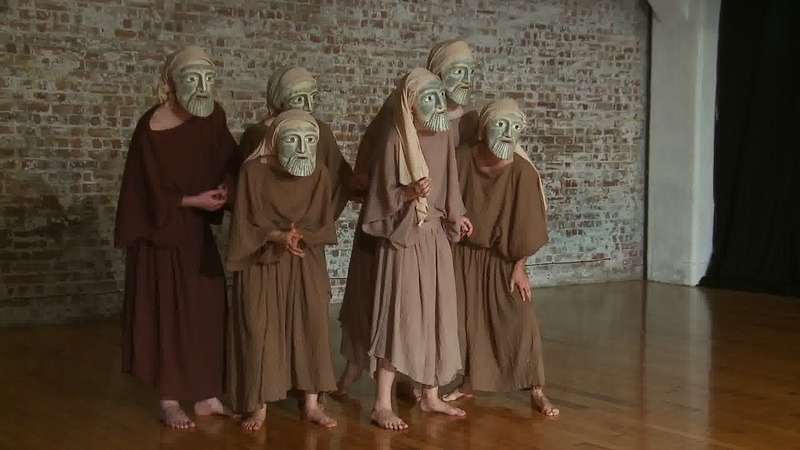 The seven gates of Thebes are defended by seven champions, one of whom is Eteocles himself. The Thebans successfully defend their city but in the battle the two brothers kill one another. The action of the Antigone takes place in front of the royal palace and starts during the night after the battle. 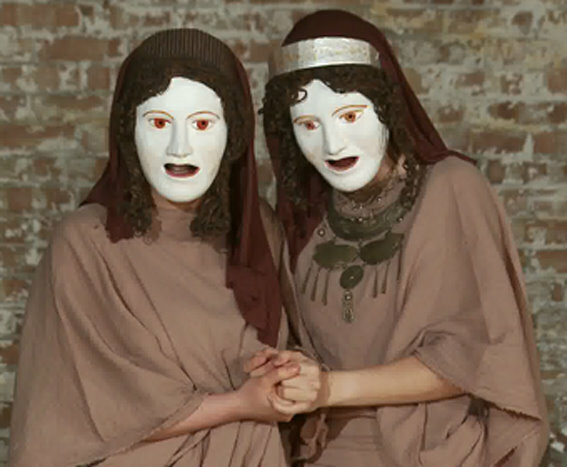 Antigone and her sister Ismene meet for a private discussion outside. 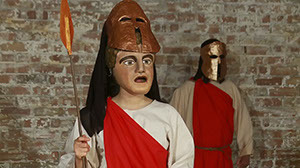 Antigone has discovered that the new King, their uncle Creon, has decreed that whilst their brother Eteocles is to be buried with full military honours, Polynices in being a traitor, is to be left unburied and that the penalty for disobeying this law is death. Antigone intends to give her brother decent burial, an action that would transgress the behavioural norms expected of citizens (in obeying their leader) and of women (in obeying the male head of their household). She wants Ismene to help her but her sister tries to persuade her against so rash an action. After a quarrel Antigone leaves to bury their brother all by herself. As the sun rises the Theban elders arrive. 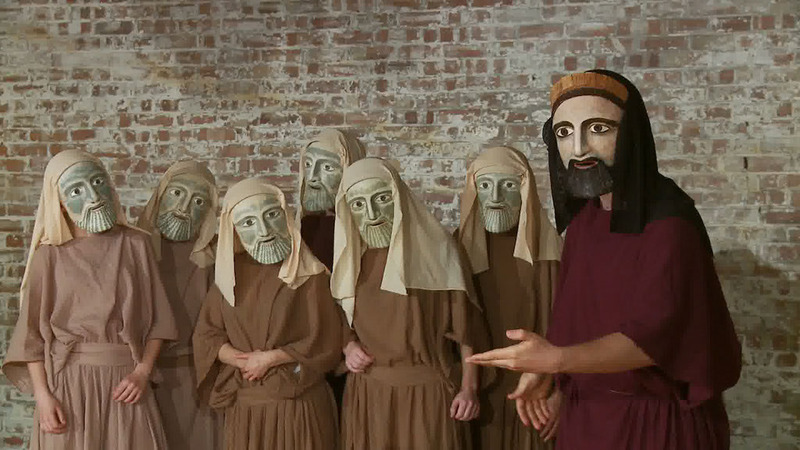 They have been summoned by Creon who makes a statesman-like speech and tells them of his decree. Then a sentry, one of those left to guard Polynices' corpse, comes to report that the body has by some miraculous means been covered by a fine layer of dust and has thus received a ritual burial. 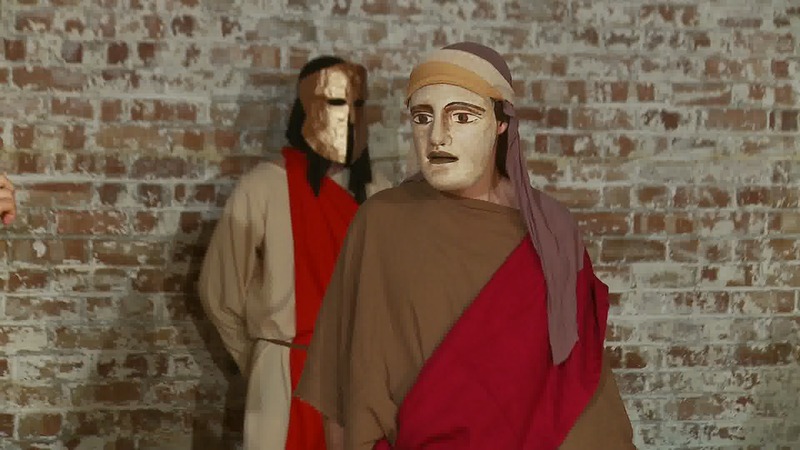 Creon angrily dismisses any suggestion that the gods may have played a part in this and instead accuses the sentry of receiving bribes and charges him to find the guilty person, threatening dire consequences if he fails. The sentry returns with Antigone as a prisoner. She has been caught trying to give Polynices a second burial. In the battle of wills that follows between Antigone and Creon neither is prepared to give way and each accuses the other of insanity. For him her transgression constitutes a challenge to his (male) authority. Moreover sanctioning the burial of Polynices would be to honour an enemy as a friend. She, on the other hand, sees herself as obeying a divine law that takes precedence over any mortal decree. The King orders her death and also accuses Ismene of participating in the crime. Ismene is only too ready to share her sister's fate (which shows that she is no coward) but Antigone rejects her. She had no part in the burial and had chosen life rather than death. 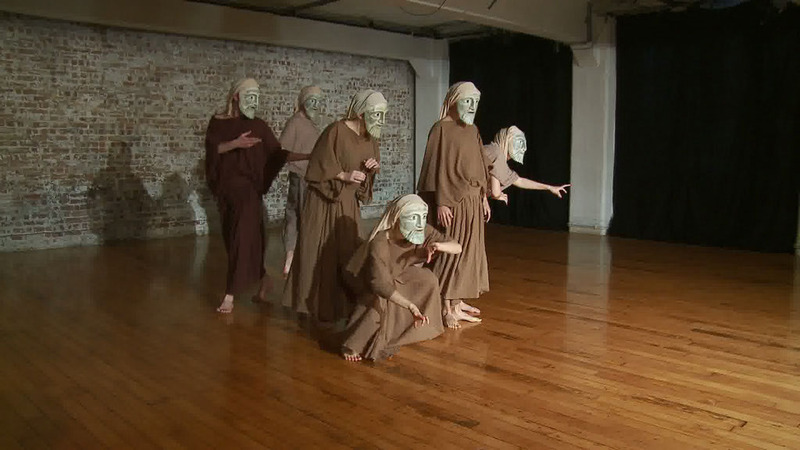 As the sisters argue Creon dismisses them both as mad. After they have been taken inside under guard he admits to the elders that Ismene is innocent and should not be put to death. 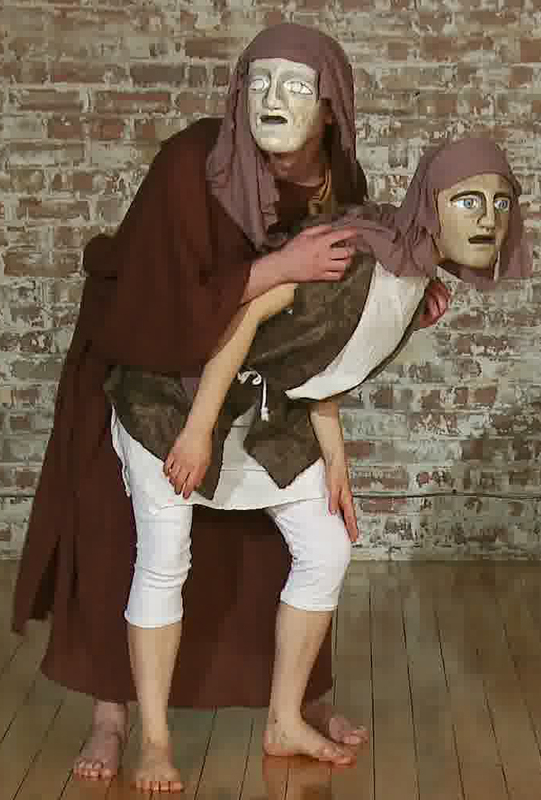 until she is finally dragged away by Creon's guards. The blind prophet Tiresias, led by his boy, approaches the King and his elders. 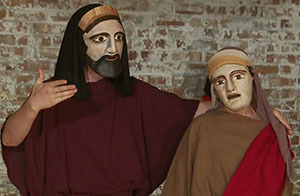 Tiresias warns Creon that the unburied corpse of Polyneices has polluted the altars of the city. The king refuses to take heed and accuses the seer of corruption. In his anger Tiresias predicts the immanent death of one of Creon's offspring (Haemon); a corpse for a corpse in return for having blasphemously entombed a living person (Antigone) and for having kept above the ground something (the body of Polynices) that belongs to the gods of the under world. Tiresias and his boy leave and the king badly shaken by his words at last asks his elders for advice and sets off to try and rectify his mistakes. The elders in a celebratory mood sing an ode to Bacchus. However a messenger arrives with the news that Haemon has taken his own life. Haemon's mother, Queen Eurydice comes out of the palace and the messenger tells her how Creon first went to bury the body of Polynices and then on to the cave where Antigone had been entombed. In the cave they had seen a tragic sight. Antigone had hung herself and Haemon lay with his arms around her, lamenting. Creon called out to him but Haemon drew a sword against him, missed and then plunged it into his own body before taking up Antigone once more and dying- a marriage in death. After hearing the messenger's account Eurydice re-enters the palace without a word. The grieving, repenting King returns with the body of his son. Soon he has to bear further misery when the messenger reports that the Queen has taken her own life with a sword blow, calling down curses on Creon as she died. Utterly crushed Creon prays for death but the elders counsel him to accept his fate. He is led away leaving the elders to make sense of the events that have occurred.